After months of waiting, the feasibility study produced by TACP Architects Ltd has been made available for examination by the Customers, Performance, Resources and Governance Scrutiny Committee . We are in the process of evaluating the report, but the key take away is that IT IS POSSIBLE to re-use the building for primary school education, something that Save Our Heritage have been saying for over 2 years. Whilst the costs involved in re-furbishing the school have been quoted at £11 million in the local press - this is exactly the sort of negative news that Wrexham Council are keen to spread. The figure of £11 milion (actually its closer to £12 million) is to convert the school for primary use, AND use some of the building for office space. In terms of cost per square metre, the figure that most developers use when making comparisons, it is actually cheaper to re use the school than to demolish it and build a new school. The best value option presented is to re-use the school AND build another small school on the playing field (option 4 in the report). This would cost over £17 million, but you'd be getting two desperately needed primary schools at the lowest cost per square metre. There are also many benefits from using a building with a fine educational history - and keeping the building plays well into the ongoing town centre heritage consultation. Many of the best performing primary schools (according to Ofsted) in towns and cities close to Wrexham are based in older buildings. This surely proves that the performance of a school is not directly linked to the age of the building, and that in fact, older buildings can stimulate young inquisitive minds. The full report can be viewed by following this link . The Scrutiny Committee meets on Wednesday 26th September at 10am. The public are welcome to attend. It will be held in Room 1, The Guildhall. We'll be there - why not come along and support us and your local Councillors. The Scrutiny Committee meeting held in June did not address the Grove Park School situation as expected. Officers have delayed the report stating that although the feasibility study was complete, they hadn't had enough time to review its contents. The study, undertaken by local company, TACP Architects Ltd, was due to be completed by the end of March, giving the Council nearly three months to consider the results. An article on Wrexham.com states that a report will now be presented by Council Leader Mark Pritchard at the Scrutiny Committee meeting scheduled for Wednesday 26th September. We'll be there to keep an eye on proceedings. Why not join us? It starts at 1.30pm in Meeting Room 1 at The Guildhall. We are currently awaiting the outcome of a feasibility study that Wrexham Council are undertaking into the viability of the school building for use in future primary school provision. Save Our Heritage had offered Wrexham Council access to funding for this study, on the condition that access to the building was given to an independent surveyor, as stipulated by the funding source. Wrexham Council declined this offer, presumably happier to spend tax payers money on a study that would have cost them nothing. We have asked Councillor Phil Wynn (Lead Member for Education) repeatedly for the terms of reference for the study, and for details regarding the tender process, but to date (May 2018) he has yet to reply. In November 2017, Councillor Carrie Harper put forward a proposal regarding the school to the Customers, Performance, Resources and Governance Scrutiny Committe. It was accepted for further consideration. She said "This topic is of great public interest and I'm glad that the Scrutiny Committee agreed to include it on their work programme. We don't have a clear picture in terms of the Council leaderships plans for the building and site. We need further clarity in terms of how they plan to move the situation forward. It's also important that other members can input their thoughts and ideas, as well as scrutinising the decision-making process to date. "Whatever your view on The Groves, surely everyone can agree that we need to move forward and bring this key town-centre building and site back into use. It's been in limbo for far too long as it is and we need a firm foundation to explore all the future options. That process should take place openly, through public meetings at scrutiny. "I'm also hoping the committee will consider the potential of using outside funding for a future options appraisal. I'm aware that the Save Our Heritage group, which campaigned to save the building, has offered to explore getting outside funding from the Architectural Heritage Fund for an options appraisal. "So far the Council leadership has dismissed this offer out of hand but, at a time when the council is having to make cuts to services and staff, I can't understand the rationale for not exploring this further. If local residents, groups and others want to input, why not let them?" We understand that the Scrutiny Committee has delayed this proposal, and it will not be discussed until their meeting on June 27th 2018. By that time, we suspect that the Feasibility Study will be complete, so the Council will have no more excuses for their lack of progress. 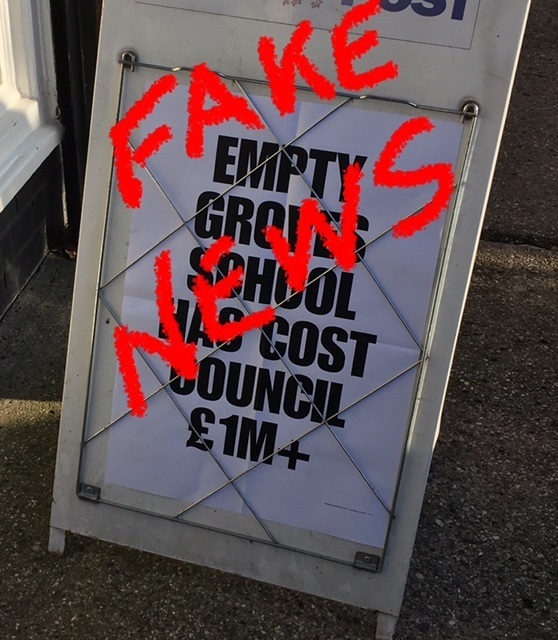 The Leader (Wrexham edition, 18/01/18) carried a headline article which read "Groves has cost Wrexham Council more than £1.1 million", followed by the text "The old Groves School has cost Wrexham Council more than £1.1m since 2015-16. A Freedom of Information request seen by the Leader revealed the authority has spent £1,107,516 on the facility in Powell Road from 2015-16 until December 29, 2017"
Unfortunately, this article is factually incorrect for several reasons. The Freedom of Information request concerned was from a local resident, who asked "Can you please let me know how much the Groves school site has cost the Council since it was closed as a school". "Wrexham Council has incurred expenditure for this site since the 2015/2016 Financial Year, when it stopped being used a School." "The total expenditure incurred to date as at 29/1217 totals £1,107,516." As most who have been following the story will know, the building hasn't been used as a school since 2003. It has seen infrequent use for various projects since then, but not as a school. The Council state that they have incurred costs during the 2015/2016 Financial Year. This is only to be expected, as the building contained asbestos, and was subject to a environmental monitoring, and subsequent asbestos removal. In the same financial year, the Council decided to challenge the listing decision, so legal costs are included in these figures. The FOI states that the costs incurred to date (29/12/17) were over £1.1 million. It DOES NOT say that in the 2015/2016 Financial Year, the costs were over £1.1 million. The Leader has got it wrong - again. Our analysis of the costs attributed to Grove Park School between 19th Jan 2015, and 21st June 2016, totalled £173,235. We will update this figure when Wrexham Council release the next quarterly financial reports. The total costs incurred from 14th April 2010 till 21st June 2017 amount to £538,010. So - we disagree that the Council has incurred costs of over £1.1 million since 2015. This is totally incorrect. We also dispute the date is ceased to be used as a school. Finally, the figure the Council use for total costs is incorrect, for reasons we've detailed previously. Unlike The Leader, we base our statements on fact. We provide evidence to support our figures in a spreadsheet which can be downloaded from this link . Failure to clarify the statements made on the FOI has resulted in a totally misleading article being published in print and online. We have raised a formal complaint with NWN Media Ltd, requesting the article is corrected accordingly. After much discussion with existing supporters of Save Our Heritage, and several heritage funding partners, it was decided that the next step for the group would be to form a Community Interest Company (or cic as they are more commonly known). The results of a survey conducted earlier in the year revealed that supporters wanted to continue to protect heritage buildings throughout Wrexham County Borough, not just in the town centre, and not just Grove Park School, which was the cause that saw the group come together in January 2016. By becoming a cic, we will be in a better position to submit bids for heritage project funding. With the formation of the company comes additional responsibilities and commitments. We will strive to safeguard heritage buildings in the Wrexham area, and promote their importance to local history and our sense of place. In the near future, we will be making an application form available, which will allow anyone with a keen interest in Wrexhams' heritage, to become a member of the company. Our new Facebook page is here . The first week in October 2017 saw Wrexham Council contractors carry out a "site clean" following the dispersal of the homeless camp a week or so earlier. This involved scraping the top layer of soil and grass with a mechanical excavator, and removing the foliage from around the base of the building. We understand that much of the soil and grass will be sent for incineration, due to the presence of hazardous substances such as used needles and human waste. Currently, more of the building structure can be seen, and it appears to be in good condition. However, by springtime next year, the weeds and foliage will start to re-grow, so we therefore expect to see the building looking neglected once again. Security has been improved by the addition of a mesh fence placed behind the low brick walls. This effectively means the entire school field can no longer be used for playing football or dog walking, as even when the homeless camp was present, local residents continued to put the green space to good use. Firstly, homelessness is a huge issue affecting every major town and city in the world. The causes of homelessness can be many, and complex. Please remember that it’s not just Wrexham Council, the NHS, and other public services that have failed these people, its society as a whole. For whatever reason, these people have no permanent place to call home. We understand that Wrexham Council and other agencies are trying to work out what the next steps for dealing with the situation should be. This won't happen overnight, but it is something they are trying to deal with. There is no easy solution to the problem, and very likely, whatever measures are put it place, will only be temporary. There have been many comments on social media suggesting that the former Grove Park School building should be turned into a homeless shelter. Those that make these comments are clearly unaware of the condition inside the school building. It is not, by any means, habitable, and it would not make “an ideal place to put the homeless”. Apart from the safety implications of trying to live in a building that has been neglected for many years, there are social impact issues around placing large numbers of people with similar problems under one roof. The proximity of the encampment to a busy road worries us greatly, as does the use of open fires. Many of the people at the camp are often under the influence of drugs or alcohol, and in this condition, they aren't able to make the sort of judgements that unimpaired people would make. We are deeply concerned for the safety of these people, and do hope that the matter is resolved before a major accident or death occurs. We feel that the comments on social media do little or nothing to actually help the people involved. If you want to make a real difference, we suggest you volunteer your time at a homeless shelter, or donate to one of the many charities that provide assistance to those who are less fortunate than ourselves. Council leader Mark Pritchard announced earlier today (8th August 2017) that the Council had plans to deliver one or possibly two schools on the site. How this announcement differs from earlier plans remains to be seen, but as the announcement lacks any real detail, it's impossible to tell. Rumours had circulated regarding the possibility of removing the covenants from the land that the school sits on, but we have no further information regarding this at present. If the Council are planning one or two schools, then there would be no need to remove any covenants, perhaps saving a long and costly legal battle. Save Our Heritage are naturally cautious about these statements, but continue to work in the background as unofficial ambassadors for the building. We hope to have some major news of our own in the not too distant future, but unlike Wrexham Council, we'll include as much detail as possible. Watch this space ! An article in The Leader today (January 17th 2017) highlights once again that Councillor Pritchard believes everything that Wrexham Council officers tell him. He now refutes the claims that he misled other Councillors over the costs involved "maintaining" the former Grove Park School. Cllr Pritchard said: “I have consistently gone on the record to state the upkeep, maintenance and security of the former Groves has cost Wrexham’s taxpayers more than £1m, and reiterate that this figure is correct." Using the Councils own data, publicly available in Excel format here , we compiled a new spreadsheet which collates every line of data from all 25 quarterly payment spreadsheets since 2010, referring to entries made which referenced "Grove Park" or "The Groves". This resulted in an accurate and more detailed breakdown of costs than previously available as the result of an FOI request made by the Daily Post. As you can see from the table above, the figure IS NOT £1 million. It's not even close. And its NOT on "upkeep, maintenance and security" - over 50% of the costs were actually spent on demolition of the Science Block and Sports Hall. Our spreadsheet is available for anyone to download here . We have used the Councils own data to prove Councillor Pritchards figures are wrong. We challenge Councillor Pritchard and Wrexham Council to provide hard evidence that £1 million was spent maintaining the building, because right now, their figures are way off. In fact, they are just under £800K off - that is if you, like us, believe that maintenance does not mean demolition, gas or electricity! The buildings were in use as recently as 2012, by a number of different organisations. If the building is in use, then costs will be incurred. We are sure that the Council were more than happy to accept the £43765 they received in income from the use of the building nevertheless. We then analysed each item of expenditure by cost code. Four main cost codes were used for the Grove Park building, and after making an FOI request, we were able to attribute each item of expenditure to a specific department. The majority of these costs associated with the school (£367,261) were charged to the Councils Capital Program, or Housing & Economy Department. The costs charged to the Education Department totalled £51,363. We should also point out that in 2008, Councillor Neil Rogers promised the people of Wrexham "that the building would not be demolished and would stand as a tribute to the women of the early 20th century who fought for equal rights". The Council chose to retain the building 7 years ago, so should have been fully aware of the cost implications associated with this decision. In a statement released yesterday (10th January 2017), Wrexham Council announced that it would not be challenging the listing decision through the courts. They stated that the legal advice they had received indicated that Minister Mark Drakefords reasons for listing were stronger than the original decision. This may well be due to the new material that Save Our Heritage presented to CADW, which we will make public in due course. We are now cautiously optimistic that there will be a future for the building within the townscape of Wrexham, and that the building can be renovated for use in the education of our children. We were also concerned that once again, Councillor Mark Pritchard is quoting highly dubious figures about the costs to "maintain the building". The £1 million figure is totally misleading. Our breakdown of costs to date, based on information received as the result on a Freedom of Information request, is that the real figure is closer to £0.3 million. Read our "Fact or Fiction" page to see this for yourself. The other costs are for demolition of the more recent parts of the building. We feel that Councillor Pritchard, is confusing demolition of another structure with "maintenance". He also goes on to state that the building is unsuitable for use as a 21st Century school, but fails to back up this statement with hard facts. Our research indicates that this is not the case. Councillor Pritchard also states that the restrictive covenants "severley limit its future use". This is totally incorrect. The covenants ARE NOT on the building, they are on the LAND. They do not affect how the building is refurbished whatsoever. Councillor Pritchard clearly does not understand the situation, which is deeply worrying. Our full press release regarding this latest news can be viewed here. As expected, the Executive Board meeting held on the 13th December resulted in the delegation of the decision to challenge the listing to the following people. However, the Leader did promise to keep all other Councillors informed over the Christmas period. It was interesting to note that the running order for the meeting was changed, bringing the Splash Magic grant item in first. A strategic move indeed. Update: Jan 2017 - We approached several local Councillors whether asking whether they had been kept informed of the situation, and - typically - none had received any information apart from Councillor Hugh Jones (Rossett), who is of course, on the Executive Board. Councillor Alun Jenkins (Offa) commented at the meeting back in December that the other 42 councillors shouldn't have to rely on news items from www.wrexham.com to find out what it going on. Once again, the Executive Board broke its promise to keep all members updated. Wrexham County Borough Councils Executive Board will meet at 10am on Tuesday 13th December to discuss the recent listing of Grove Park School, and how they can challenge the decision. The agenda for the meeting shows that the Officers of the Council wish the Executive Board to grant approval to investigate options for challenging the listing decision made last month by the Welsh Assembly Government. One thing to note is that the Officers are asking the Executive Board to delegate the authority to make any future decisions on a challenge to one man, namely Council Leader Mark Pritchard (Rhostyllen), but in consultation with the Executive Director for Place and Economy, Lee Robinson, the Head of Corporate and Customer Services (and legal advisor) Trevor Coxon, and the Lead Member for People, Childrens Services & Education, Councillor Michael Williams (Gwersyllt North). This is particulary worrying, because it means there will be no public record of any decisions these individuals take, or their reasoning to do so. We would urge the rest of the Executive Board to be strong, and stand up for the people who elected them in the first place. Vote against this decision. There's no shame in doing what is right, it's just a matter of being principled. Why not come along to the meeting? The public gallery will be open, and you can be sure of a warm welcome. Watch democracy in action. We'll be there, as always. Cabinet Secretary for Finance and Local Government, Mark Drakeford AM announced today that after considering all the evidence presented, his decision was to re-list the building, confirming the recently quashed decision made by Ken Skates AM in August this year was sound. The Cabinet Secretary stated "My decision is to list the building, with its historical dimension, on the ground of its special architectural interest due to its aesthetic visual quality, craftsmanship and decorative detail". The full document can be read here, and it does highlight the fact that the Cabinet Secretary has made a balanced and considered decision. Wrexham Council Leader Mark Pritchard stated "We are very disappointed with this decision and will take legal advice on the way forward". Save Our Heritage would like to point out to Mr Pritchard that there are often better ways forward that don't involve taking legal advice, and some of them are actually easier, such as engaging openly with the public in a genuine and sincere manner. Our press release regarding this news can be read here. We were saddened to receive the news that the Judicial Review into the listing decision has fallen in favour of Wrexham Council. Whilst Save Our Heritage were included in the legal proceedings as an "interested party", we were unable to present our case, as the potential costs involved in challenging the case would have been significant, and as a unfunded voluntary group, one we were unable to bear. We understand that the decision to list will be taken again, potentially before the end of November. We have released a statement regarding this news, and it can be read in full here. In brief, we are concerned that the building could now be demolished before the School Placement Strategy is finalised, and the Councils own Heritage Strategy isn't ready yet. Both of these processes won't be complete until 2017. Questions have to be asked about Wrexham Councils real motives here. The Council Officers actions (all rubber stamped by the Executive Board) have been "hell bent" on removing this building, and have gone to extraordinary lengths to get their own way. The demolition decision was taken before the legal implications of the Covenants that exist on the site were considered. There is no mention of the site in the School Placement Strategy. No funding for a new school has been applied for. In a move guaranteed to disenfranchise the citizens of Wrexham, the powers that be at Wrexham Council, have decided that the best way to win over public confidence is to launch a legal challenge to the listing decision taken by the Welsh Assembly Government. It is our understanding that this legal action will cost tens of thousands of pounds, with a limited chance of success. "There is no guarantee that partners involved in developing a replacement school would be happy with the proposals to provide a compromise to the design of a modern primary school." So it does look like the Council have a prospective taker for the site lined up already, but nothing about this has been made public. Why the secrecy? Perhaps the Catholic Diocese have a non-disclosure agreement in their pre-contract negotiations? You can read the full WCBC Press Release here. Wrexham Council Executive Board to discuss future of the school - BUT - you're not invited ! The Executive Board of WCBC will meet to discuss the future of the school building at a meeting next Tuesday 6th September. However, the agenda for the meeting has been restricted, and the press and public will be excluded. We believe that this is a huge mistake on the part of the Council. They have received much criticism in the past for lack of transparency, and this is just another nail in the coffin for the present incumbents of the Executive Board. We have it on good authority that the agenda contains very little that needs to be discussed in secret, and that there is in theory, no need to apply a "public interest test" to this content, and that the Council are mis-interpreting their own Constitution. Either way, we'll be there in the public gallery as usual. We'd appreciate your support, so feel free to come along at 10am to view the first part of the meeting. Whether the Council will have a change of heart about holding the majority of the meeting in secret remains to be seen. We got the news today, that the building will is now officially GRADE TWO LISTED. We were overjoyed to learn that Ken Skates AM, Cabinet Secretary for Economy and Infrastructure, was formally listing the building, effective immediately. Thank you to everyone who believed that a town is defined by its history and heritage, as much as by it's people. Our gratitude is extended to all those councillors, politicians and members of the public who have supported this campaign from the very beginning. Our press release covering this news can be read here. It looks like the asbestos removal contractors (M J Finnigan) have completed their program of works, as the temporary compound has been vacated, and there are no longer any workers on site. However, there remains a substantial amount of scaffolding around the central quadrangle areas of the building, with a working platform at gutter height. It would be reasonable to assume that the presence of scaffolding would increase the risk of vandalism, so quite why it hasn't been dismantled yet remains a mystery. Perhaps WCBC would like to contact us to explain this in more detail? 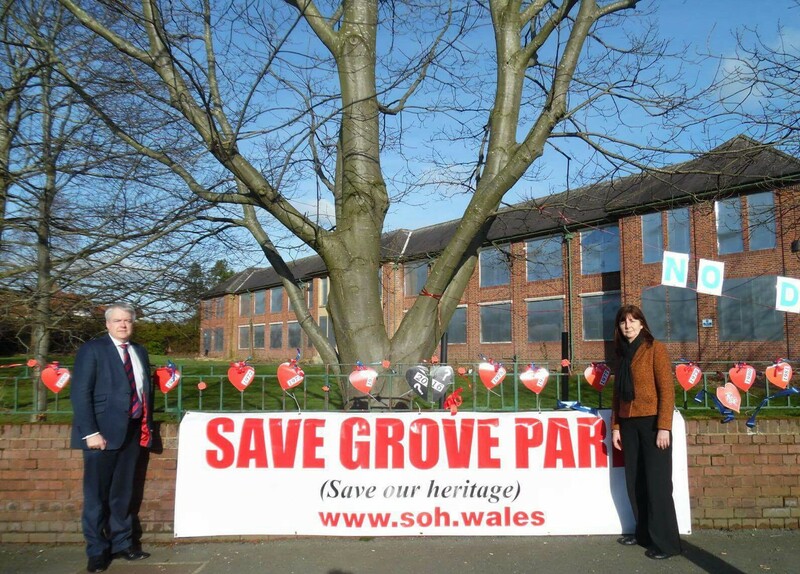 In a letter to CADW, deputy director of SAVE Britain's Heritage, Mike Fox, wrote "It is clear that the local community has considerable affection for Grove Park, and there is a strong desire to see it remain part of the town's historic environment. Listing the building at Grade II will ensure this is the case, and will be greatly welcomed. SAVE fully supports this listing." You can read more about their work on their website - here. Save Our Heritage campaigners were overjoyed when they received word from CADW that the building they had fought long and hard to save from demolition, was to be listed. In an e-mail to Roland George, who submitted the request to list the building, CADW caseworker Philip Hobson stated that subject to a 28 day consultation period, the building would become Grade 2 listed. During the consultation period, CADW are inviting comments from Wrexham County Borough Council, and the Royal Commission on the Ancient and Historical Monuments of Wales. Elaine Guntrip-Thomas, chair of the Save Our Heritage campaign group, said “I'm delighted that CADW have finally recognised the importance that this building plays in defining the heritage of Wrexham. Our team of volunteers worked extremely hard to gather the information that was submitted to CADW. We're looking forward to seeing how Wrexham Council will integrate the building into their plans for future education within the town centre”. Designed by the Denbighsire County Architect Gilbert D Wiles, the school was officially opened in 1939. Initially as a Girls Grammar School, it became a comprehensive in 1972. Following a number of name changes, the school officially closed in 2003, but the building continued to be used by a number of other groups until 2012. Contractors are currently carrying out asbestos removal at the building, with the work set to be completed in mid July. A small victory - or just a step in the right direction? At a meeting of the full Council on May 18th 2016, an amendment to the Notice Of Motion (submitted at the meeting held on 23rd March 2016), was successfully voted through. The amendment now requires the Executive Board to review their decision REGARDLESS of the listing decision to be taken by CADW / Welsh Assembly Government. This review must take into consideration all the facts that surround the recommendations made to the Executive Board by Officers of Wrexham County Borough Council. Not all the information was presented at that time, which includes communications between the Education Department and the Board of Governors at St Marys RC Primary School, and the Catholic Diocese. This information was made public as the result of a Freedom of Information request, which in turn, we circulated to all 52 elected Council members.A press release detailing the exact nature of the emails will follow shortly. You can watch the meeting again by clicking here. Please note the audio is very poor in places. We are in the process of producing our own copy of the meeting, which will have the audio levels restored to normal. We will be holding a public meeting this coming Wednesday 11th May starting at 7pm. The venue will be St Margarets Church, Garden Village. There will be refreshments available, and parking will be in the church grounds, or in neighbouring streets. Note that the meeting will be in the church itself, and not the hall. The continuing loss of Wrexham's heritage threatens to define our town as it grows to meet the needs of our population. But future inhabitants need a sense of pride in our town just as we do. They also deserve a town boasting well-maintained heritage; interesting buildings, areas with links to the past which define Wrexham’s identity and place in history. Already, much of our heritage is unavailable for people to explore; others will not be listed. So unless protected it will disappear under our noses, unless we, local people, are listened to. Does the unloved heritage of Wrexham make you dissatisfied? Do you feel that local people have no say? Please join Save Our Heritage at a Public Meeting next Wednesday May 11th at 7pm at St Margaret’s Church, Chester Road, Garden Village, Wrexham. Guest speakers will whet our appetite for change. If you've been following our campaign, or read any articles in the local media, you'll notice that the Leader of the Executive Board at Wrexham County Borough Council, Councillor Mark Pritchard, repeatedly states that it's cost £900,000 to "mothball" the former Grove Park School. This figure is a so inaccurate, it beggars belief. From the figures given in a spreadsheet obtained as a result of a Freedom Of Information Request by a Daily Post reporter, we can tell you the real costs to date incurred by the building. The actual costs of repairs and maintenance, and security for the 10 years from 2005 till 2015 were £219601. This is vastly different from the figure quoted by Councillor Pritchard. Not forgetting that the building was in regular use by a number of organisations from 2006 till 2013, so maintenance would have been required and entirely appropriate. The school was never truly "mothballed", it just fell out of use, and became neglected. Asbestos removal and demolition of modern science block in 2012/2013 : £277753 - charged as Capital Expenditure - so not paid from Education Budget. We would like to make it clear that Save Our Heritage are a non-political group, whose sole aim is to safeguard the older buildings of Wrexham. We have no political allegiance whatsoever. We have received help from individuals and groups, from the many political parties that are based in the borough. We are grateful to every single one of them for their support. We wouldn't be where we are today without your assistance, and for this, we thank you all. We're delighted to announce that our petition (both written and electronic) has passed the 3000 signature mark. This is quite an achievement for such a brief campaign period. So - thank you - for all your support. For the record, the number of people signing the petition is now greater than majorities held by the ALL the Councillors who sit on the Executive Board - ADDED TOGETHER, (based on the 2012 election results) ! Makes you think - doesn't it ? Perhaps the outcome of the May 2017 local elections will be different ? We'll be there to make sure it is ! The Executive Board will be considering the Notice of Motion presented by the Council at the full Council meeting of 23rd March 2016. This motion was deferred by the Deputy Mayor at the last meeting, despite objections from the floor, as a number of members of public present in the viewing gallery had attended specifically to hear this debate. The Notice of Motion, signed by fourteen Councillors, requests the Executive Board to reconsider its decision to demolish the former Grove Park School building. To quote Dr Helen Paterson - (WCBC Chief Executive) when speaking at the "Difficult Decisions" event recently - "the Executive Board are answerable to you, the public". Well - here is the Executive Board - why not ask them a question? It's possible to do this at most Council meetings, but as it's a little used procedure, some Council staff aren't fully conversant with the process. "Citizens have a right to participate in the Councils and Executive Boards public question time". Be bold, be brave, but more importantly, be there ! Hope on the horizon ? But first - a word of caution. We received news yesterday (23rd March 2016) that Ken Skates, Deputy Culture Minister and AM, had been "minded to list Grove Park School" but due to the difficulties in listing 20th century buildings, a peer review had been requested. The full letter can be read here. This led to much speculation regarding the news, especially on social media. The situation as it stands is that a peer review of the possible listing is due to take place. The results of this are expected mid-April. Until that time, the building IS NOT listed, and in the event that the review finds against us, the building will NEVER be listed. So - we intend to keep the campaign going as planned. At the same time, we'll be keeping one eye on the building, and the other across the road, at Wrexham County Borough Council. There will be an Executive Board Meeting at 10am on the 12th April 2016. We'll be there as usual - why not join us at The Guildhall? There will be a full Council meeting this coming Wednesday 23rd March, at 4pm in The Guildhall. We have been allowed to ask two questions (no more) about the decision to demolish the school. If you can, please come along to the meeting and watch your Council at work. The more people that turn up to view from the public gallery, the better. In the meantime, why not phone or write to your local Councillor, expressing how you feel about their decision, the lack of public consultation, and the fact that in 2008, the same Executive Board passed a motion to retain the building. Whilst we're on the subject of Councillors, ask yours if he or she is actually planning to attend the meeting. You'd be surprised to find that the attendance figures for some are rather dismal. The full list of Councillor contact details (addresses, phone numbers, e-mail addresses) is here. If you're not sure who your local Councillor is, you can find out here. First Minister Carwyn Jones has confirmed that Wrexham Council DO NOT need to demolish the building in order to apply for funding to build a school that meets the 21st Century School Program requirements. Aled Roberts AM asked "Will you make it clear to Wrexham council, therefore, that there is no expectation upon them to rush into demolition of this historic building?" Carwyn Jones replied "Well, they don’t have to do that; that’s true. I have stood outside the school with Lesley Griffiths, as the Wrexham Member, and I know that this is something that is extremely important to the area, and people are unhappy with Wrexham council’s decision to demolish the building. But, the important point is that the council realises that they don’t have to do this." You can watch the webcast of this discussion here. Join us at 10am on Tuesday 8th March at The Guildhall, where we have questions to ask the Executive Board meeting. 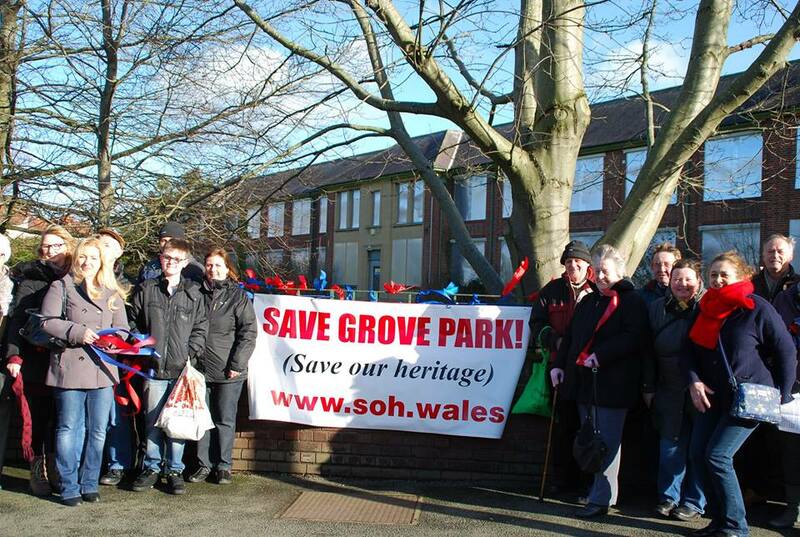 "The ‘Save Our Heritage’ group still hold out hope that the former Grove Park Girls School building can be retained and refurbished, thereby continuing to make a valued contribution to our town’s built environment but more importantly as an educational establishment, fit for purpose in the 21st century. They are therefore pleased to learn of the education department’s intention to retain the site for the provision of one possibly two primary schools, in the spirit of the covenants. They are hopeful that the Lead Member for Education and the Head of Education will reconsider the decision to request the Executive Board to approve the demolition of the former Grove Park Girls School. As an alternative solution would they consider the appointment of an external architect to carry out a feasibility report so as to ascertain the possibility of converting the Grove Park Girls School buildings for use as a primary school which will meet the conditions laid down by the Welsh Government 21st Century School Programme, and if this is the case that it can be delivered at an acceptable cost? It is their understanding that a feasibility report could be carried out within a relatively short period of time. They would like to stress that their request should not be interpreted as a stalling tactic, but one of asking for evidence to be placed on record, which demonstrates that councillors’ decision-making is based on factual evidence and critical analysis. If detailed work has been previously carried out to this end, then they would like to ask why this information was not shared will all elected members as part of the report which went to the Executive Board during January 2016? Finally, if a third party representing a faith based school has been consulted, could you please confirm whether they have been given the option to pursue a converted Grove Park Girls School that would meet the conditions of the 21st century primary school programme?" Wrexham Council has approved its own plans to demolish the Groves school building, which could take place as early as April. Save our Heritage, which is campaigning to save the school building as part of the future redevelopment of the site, has expressed its disgust at the decision. Elaine Guntrip-Thomas, who chairs the campaign group, said: “The speed at which the Council is moving ahead is shocking. It’s almost as if it feels that once the building has gone, it will be off the hook and is hoping the campaign will just give up. She added: “Our efforts to protect this important piece of Wrexham architecture will continue – the council ignores the thousands of people who have signed our petition at its peril." The planning application is on the WCBC Planning website. It's application number P/2016/0042 and has been redacted to hide the applicant’s name. During a brief visit to Wrexham on Monday 15th February, First Minister Carwyn Jones visited the Grove Park School building in person. He was briefed on events by Lesley Griffiths AM. Mr Jones said it was important for the council to retain landmark buildings in the town. He also said: “I am surprised there has been no consultation but I think we have lost so many buildings in the past. The town I’m from, Bridgend, lost a lot of its buildings including its town hall in the 1970s. The late 60s and early 70s were a decade of madness when it came to town planning. Campaigners fighting to save the Groves school building from demolition have shown their passion on Valentine's weekend with a display of hearts on the railings. 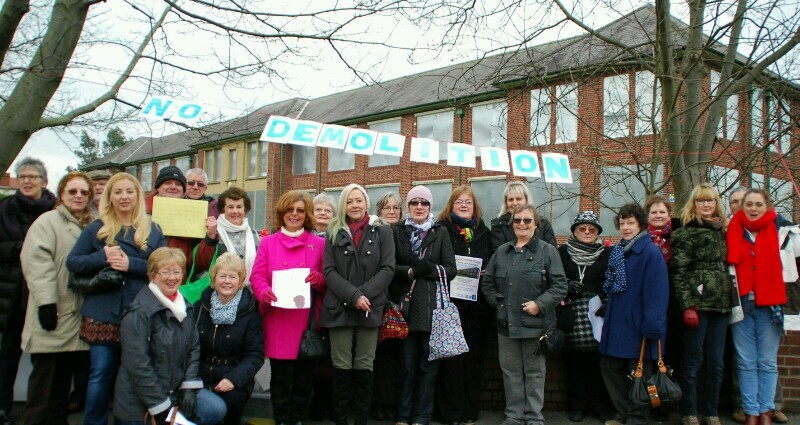 The campaign suffered a blow on Friday when Wrexham Council's legal officer Trevor Coxon told opposition councillors that he would not permit the full council to debate the demolition decision. The original decision by the 10-strong executive board has been condemned as heartless by campaigners, who feel the historic Art Deco building should be preserved for future use as a school or arts hub. Elaine Guntrip-Thomas, who chairs the Save our Heritage campaign group, said of today's protest: "It was heartening to see another good turnout at our protest this morning. We put hearts and roses around the school railings on Valentine's weekend to remind the council that some things are more valuable than they might appear. "We will meet as a campaign group tomorrow (Sunday) morning at 11am in Saith Seren to discuss our options and how we maintain the fight against the council's decision. It's far from over and support for the campaign is growing as people become aware of the executive board's decision." The protesters also put up a "No demolition" sign in front of the building, which drew many beeps of support from passing motorists. Cllr Carrie Harper added: "There are still many unanswered questions that we feel the executive board and council leader should answer before they go any further. We also need to have sight of the covenant that restricts development on the site before any demolition takes place. "The passion people feel for retaining this building is part of a wider concern that our heritage is being destroyed, that our town isn't best served by this administration and that we need them to listen more carefully. Not only is it heartless, it also gives the impression of being brainless and clueless as it makes decisions without consultation." Campaigners battling to halt the demolition of the Groves school building will be holding another public protest this Saturday 13th February. Wrexham Council's executive board decision to demolish the historic building has been met with outrage by local people, former pupils and politicians. All feel that the building, which has been empty for the past decade, is being demolished without consultation and without the public having any idea of the council's intentions for the town centre site. Elaine Guntrip-Roberts, who chairs the Save our Heritage campaign group, said: "We're not giving up. We'll meet outside the school at 11am on Saturday ​on the corner of Powell Road and Chester Road. "As it's Valentine's weekend, campaigners will be tying hearts, roses and ribbons on the railings. Materials will be available on the day but people are also welcome to bring their own. "There will be 77 hearts representing the age of the building. We want to show that we love this iconic building and its internal features are worthy of keeping for generations to come." Campaigners have also asked for the council to return their banner, which was taken down from the railings within an hour of being put up two weeks ago. The council has admitted taking it down but is now saying that it can't find the banner. Mrs Guntrip-Roberts said: "Isn't it odd that other banners on railings stay up for far longer, so it seems the council's leadership team are rather sensitive to criticism. Perhaps they know they're in the wrong on this one and want to suppress democratic debate." Carrie Harper, who is also involved in the campaign, added: "This is an important town centre site and any decision to bring it back into use deserves the full consideration of townspeople as well as the full council, not just the executive board. "As things stand the building could be flattened in 10 weeks, even though the council itself admits it doesn't plan to do anything with the site until 2019. What if circumstances change in that period? What if priorities change in that time and what if there's a new council after May 2017's elections that see the value of the building for educational or artistic purposes?" Yesterdays decision by the Scrutiny Committee was disappointing but not entirely unexpected. We see it as the first step in what will undoubtedly become a long and drawn out battle to save the Grove Park School building, and other buildings of character within the town. We are presently considering all options and planning our next move. Follow us on Facebook and Twitter (we're using #savegrovepark). The Customers, Performance, Resources and Governance Scrutiny Committee will meet this coming Wednesday 3rd February to consider if the Executive Committee acted appropriately when they decided to demolish the building. Whilst it will be a open meeting, members of the public will have no opportunity to speak. Come along and see your Council at work. The meeting starts at 2.30pm. .We're going to be there from 2.15pm outside The Guildhall. Despite the bitterly cold wind, we had a good turnout of support for the Tie a Tie event on Saturday 30th January. Together with Ian Lucas (MP) and Lesley Griffiths (AM), we tied hundreds of red and blue ribbons, and a good number of ties to the school railings. Passing motorists showed approval by beeping their horns! We wanted the council to see a visual representation of the communities love for this beautiful building. Sadly, they didn't agree, and on Monday, they proceeded to remove all our ties and ribbons. Fortunately, we have the photographs taken by Marc Jones (above) and the press which we can use to further our campaign. The signature gathering event on Saturday 23rd January gave us so much hope for our campaign. We knew there would be some people who agreed with our viewpoint - but we had no idea how many that would be. In the end, we got over 700 signatures in 3 1/2 hours, which is a lot more than we expected. Some people had made a special journey into the town centre that morning because they knew we would be there. We were impressed that almost no one we spoke to agreed with the demolition decision taken by the Council Executive Committee. We also thought that most of those who wanted to sign the petition would be former pupils, and from the older generation. We were very surprised to find that many of the younger generation wanted to sign as well, having attended the school during the last few years it was open. If you add these physical signatures to the people who have signed the online petition, that takes the current count to over 3000 people who are against the demolition of the building (figure updated 10th April 2016). That's a fantastic start to a campaign that has really only been promoted over the past two weeks.